The horse is the the State Animal of New Jersey as designated by a Joint Resolution approved by the Legislature and signed by Governor Brendan Byrne in 1977. 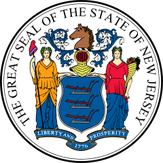 The horse's significance in the state's history also is illustrated by the prominent inclusion of a horse's head at the top of the State Seal originally adopted in 1777. Below the horse's head are three plows, signifying the state's agricultural tradition which was dependent on the power of the horse in cultivating fields and hauling wagons and equipment. Into the 1920s, the horse also was the dominant mode of transportation throughout the state. Based on the most recent survey conducted in 2007 by Rutgers University, New Jersey had some 42,500 equine animals, with about a third of the total engaged in racing activities. Racing, however, has been in long-term decline as it lost support in competition with other leisure activities, particularly those offering gambling options such as casinos. The state government has attempted to assist the racing industry through subsidies and allowing on-site off-track gambling on races throughout the country, but the future of New Jersey's three remaining tracks continues to be much in doubt. Horse farms have been impacted by development pressures, with several sold for more profitable uses as housing or other real estate ventures. They also have faced increased operating costs, including taxes and liability insurance, particularly for those which continue to be open to the public for lessons and trail rides. In some cases, county governments have sought to meet the demand for equestrian centers by adding such facilities to their existing park systems and recreational programs. Resources related to horses in New Jersey include the state Department of Agriculture, which maintains an Equine Advisory Board of representatives of diverse segments of the equine community; the New Jersey Racing Commission, which regulates tracks, trainers, jockeys and other personnel; the New Jersey Horse Council, a nonprofit advocacy and lobbying group incorporated in 1974; and The Horse Park of New Jersey, an 185-acre equestrian facility in Allentown which hosts many events and competitions. New Jersey also serves as the home base of the United States Equestrian Team, which is located at 180-acre Hamilton Farm in Gladstone, the former property acquired in 1911 by Wall Street financier James Cox Brady; the Farm hosts the Team's training for the Olympics and other world championships, as well as events such as the Dressage National Championships and many horse shows, dressage, driving events and training clinics. American Saddlebred training, boarding, sales and lessons. Individual and group lessons from beginner to advanced on 30 school horses with four full-time instructors. Horses and riders awarded National and World Titles. Summer camp with over 300 campers from across country with both day and overnight programs. four stallions and some 40 broodmares. Located on 18 acres, offers full-service boarding, training, riding lessons, horse show coaching and sales services for hunter, jumper and equitation horses and talented young prospects. Horsemanship for riders to groom, care for, and tack horse before lessons. Focus in show-jumping with clients and horses competing at all levels. Owned and operated by head trainer Amber Mitchell Harte, 30-year professional riding career. Access from I-95 and I-78, Routes 12 and 519. Owned and operated by Ann and Brad Scussell with over 40 years in training and teaching. Specialize in Morgan Horses, all disciplines, but shown and trained many breeds including American Saddlebreds, Arabians, National Show Horses, Quarter horses, Thoroughbreds, Mules, ponies and Miniature Horses. Lessons in Saddle Seat, Hunt Seat, Driving and Western. Large indoor and outdoor rings with stone dust footings; rubber matted stalls, most with windows; wooden fenced paddocks; separate boarders' tack room; heated lounge with view of indoor arena. Summer camp. Access from I-95 and I-78, Routes 12 and 519. Focus on training, showing and riding lessons for American Saddlebreds. Lesson program uses experienced horses for beginners through accomplished riders in English or Western Tack. Lessons cover cleaning and tacking/untacking. Offers birthday party and other group services. Owned by Doreen Weston, with husband involved in Saddlebred industry as exhibitor and breeder, operating Smoke Hollow for over 20 years. Access from I-95 and I-78, Routes 12 and 519. Focus on import, sales, training of Dutch Sport Horses. About 100 sales yearly, primarily hunters and jumpers, breeds 15-25 foals each year. Owner Emil Spadone Grand Prix competitor at hunter/jumper shows, trains students with 12-person staff who ride and compete in hunt seat equitation from mini stirrup through adult amateur division. Other farm in Ocala, Florida. Lessons at all skill levels for those aged 8 and above but emphasis on more advanced riders pursuing professional show jumping. Boarding services restricted to those interested in lesson, training or sales and leasing services. Advanced riders taught by international grand prix rider, Kirk Webby. successfully competed in Olympics and trained at grand prix level in show jumping in US and abroad. Indoor arena, outdoor ring, two linked jumping fields, and small cross country course with natural jumps and obstacles, 6-stall and 23-stall barns. Coaching and transport for shows. Other farm in Ocala, Florida. Off I-78 and Route 22. Show jumping stable owned by world class show jumper Schuyler Riley. Concentrates on producing champion show jumping horses and riders. Boarding, training, horses for sale or lease. Facility also in Wellington, Florida. Full service equestrian center on 52 acres. Established 1990 by Kim Herslow, gold medal dressage competitor and member of 2015 Pan American Team. Over 40 stalls, large indoor arena with second floor viewing area, covered European walker, two outdoor rings, 12-acre open riding field with dressage ring and jumping areas. and direct access to local trail association. 12 paddocks and pastures; Lesson programs focus on dressage for all skill levels. Located on over 300 acres of farmland on Route 12 between Flemington and Frenchtown. Specializes in selective breeding, training, and sales of American Saddlebreds. Farm home to several World Champion retirees and broodmares. Riding lessons and trail rides for all levels of experience, as well as private instruction for show riders. Seasonal clinics. Show barn located on Delaware River near Lambertville and New Hope, PA. Catering primarily to showhorses and their competitive riders, offers full-care, full-service horse boarding with all standard amenities. Instruction program in all aspects of hunter-seat style horsemanship. Owned and managed by professional trainer Vicki Peters. Operated by Somerset County Park Commission. Trail and group rides, hayrides, lessons throughout year for those age 9 and over, "Pony Pal" program for younger children. Horse care workshops. Horses available for rental. Indoor arena with viewing room. Off I-287 and Route 206. Specializes in English and Natural training and lessons for beginners through advanced from age four. Indoor and outdoor arenas. Boarding and sales. Clydesdales and Friesans available for rental for carriage rides, also provides other animals for petting zoos. Summer camp and birthday parties. Located off I-78 and Route 22. Owned by Debbie and Harold Kafka. 70-acre horse and sustainable organic farm. Lessons for all levels of riders, beginners through advanced. Boarding, custom training and sales. Summer camp. Outdoor training ring; large outdoor arena with professional grade footing; 8 stall barn; heated tack room; wash rack. Boarders have access to private trails on property, as well as nearby Somerset Bridle Path and Trump National Trails. Owned and operated by Toni and Pete Sauer. Located on north branch of Raritan River off I-287, I-78 and Routes 202 and 206.. Full-service hunter, jumper, and equitation facility. Training, leasing, sales. Lessons from beginner to Gran Prix, Horse Showing (International, National, B & C Rated, and Local), riding academy, summer riding and pony camp. Hosts monthly horse shows plus 6 USEF rated shows and Palermo Jumper Festival and Gran Prix. Lighted outdoor ring; 2.5-acre Gran Prix Field; heated and air-conditioned tack room. Owned and operated by head trainer Osvaldo Ornia Pacher, accomplished international Gran Prix rider. Boarding, training, sales, leasing, hunter/jumper show coaching, lessons for all levels, summer camp. Commenced show team at different skill levels fall 2016. Indoor arena with heated observation area; outdoor arena; each arena with new stone dust based footing; insulated barn with tack room and tack areas; box stalls; grass paddocks. Established 2014 by owner and head trainer Genna Centolanza, extensive show career in jumpers and equitation. Located at 40-acre Hidden Hills Farm close to Routes 206 and 202, I-78, and I-287. English-style riding lessons for ages 7 and above from beginners to advanced. Therapeutic riding program in 25th year of operation. Summer camp, scout and group programs.. Boarding and leasing. Indoor arena, two large outdoor rings with full sets of jumps, smaller ring for lunging, matted stalls, 10-acre pasture. Located just west of Princeton off Routes 206 and 1. Horse training and lessons by certified master instructor Tracy Wagner, background ranges from dressage and jumping to reining, colt-starting, and driving, also publishes online videos for purchase.. Located in Capik Nature Reserve with 500 acres and eight miles of trails. Guided trail rides for age 12+, pony rides, group rides, riding lessons. Summer camp. Access from Garden State Parkway and NJ Turnpike to Route 9. Specializes in equine rescue, owner Dorothy Nadon often attending public auctions to buy aged, neglected and disabled horses. Located on 10 acres surrounded by wooded areas for trail riding. Outdoor lighted arena with jumps, poles; stalls include foaling stall; run-in shed in fields. Sales, leases, boarding, lessons for beginners and intermediates in English and Western. Established in 1996 by Gary and Susan Ippoliti, with over 40 years of experience. Indoor arena, lighted outdoor ring, and 12 grass covered private turn out pastures; indoor and outdoor wash areas; box stalls and tack room. Boarding, sales, individual and group lessons for all skill levels, summer camp. Owner Anne Stevens certified instructor in Centered Riding®. Centered Riding was developed by Sally Swift, internationally-acclaimed author of best-selling books and videotapes on all aspects of horsemanship. Owner Anne Stevens certified instructor in Centered Riding® system to use breathing, balance and vision for more relaxed control of horse. Offers lessons for all skill levels, summer camp, also sales, boarding. Located off Route 130 and Route 1. Three barns with matted stalls, attached indoor ring, and outdoor ring both with all-season fiber footing; turnout fields and paddocks of various sizes; grooming bays and wash stalls, and large Great Room above barn with view into the indoor arena. Boarding, sales, training, lessons in Hunter, Jumper, Equitation for beginners through advanced. Thoroughbred Division provides retraining and rehabilitation. Active show schedule, offers coaching prior to shows on and off-site. Operated by Elisa and husband Neal Shapiro, both former Olympic Team members, Neal inducted into National Hunter Jumper Hall of Fame. Located just south of Trenton, access from I-295, Routes 1 and 33. Operated by Mercer County Park Commission since 1994. 31 stalls, indoor and two outdoor rings, two grooming stalls, two tack rooms, two feed rooms, four wash stalls, and eleven horse pastures. Lessons, trail rides, summer camp, parties, boarding. Adaptive Riding and Equine Assisted Activities & Therapies for individuals with special needs. Boarding, training, sales, leasing, summer camp, Private or group lessons for beginner through advanced from age 5 and above. Main barn with 8 stalls, tack room, grooming areas and hot and cold wash area; indoor ring with sand/rubber footing, outdoor training area, round pen, equiciser, and large grass pastures with water and run-in sheds. Located adjacent to county land with miles of trails, off Routes 31, 206, 202 and I- 95 and I-295. Lessons, boarding, and training on 28-acre farm. Specializes in Hunter Seat Equitation, Jumping, and Dressage. miles of trails, 1/4 mile track, lighted outdoor jumping ring and dressage ring, and new Morton indoor riding arena. Summer and spring break camp. Year-round riding academy in English and Western for all skill levels with summer camp. Boarding, training, horse sales, rated horse shows and schooling horse shows. Two outdoor rings, indoor arena with heated/air conditioned viewing rooms; barns with matted stalls. Family owned and operated since 1970. Located in Marlboro northwest of Freehold, access from Route 520 via Routes 9 and 33. Full-service boarding facility, also offers riding instruction, horse training, showing, horse sales. Large indoor and outdoor lighted arenas, heated/air conditioned viewing lounge surrounded by 5/8 mile track. Grass turnout paddocks with run-in sheds. English instruction for individuals and groups from beginner to advanced. Summer and winter camps. Birthday parties with horses, petting zoo, crafts. Boarding, sales, leasing, lessons on 25-acre farm. Lessons year-round for beginners and intermediate riders from ages 3-1/2 and up, summer camp. 25 horses and ten instructors. Large indoor and two outdoor riding arenas. Focus on Dressage. Training, sales, leasing, boarding, lessons. Established 1999 by Lisa and Chris Post. Indoor arena with rubber footing and heated viewing room; lighted outdoor arena; 14 stall barn with heated tackroom and lavatory; grooming and wash stalls; group or individual grass turnout fields. 31 acres adjacent to Assunpink Park Preserve with over 6,000 acres of trails and five minutes from New Jersey Horse Park. Boarding, sales, training, lessons. Outdoor lighted arena and indoor arena with heated/air conditioned viewing area, large jump ring, round pens. Offers both English and Western lessons. Purchased 2011 by Joe and Mary Ann Poole, long-time boarding clients at Wind Dance and trainers of Arabians. Off NJ Turnpike and I-195.